2bdrm Adulte seulement-, 1 salle de bain, 10e étage, Centre-ville, vues sur le port, l'emplacement idéal! Un vrai bijou au cœur du centre-ville de Victoria! Profitez de la vue sur le port à couper le souffle ou les lumières de la ville vibrante ... chaque vue de cette retraite de luxe est sûr de plaire. 'Hôtel de Paris est livré avec une cuisine entièrement équipée avec des appareils de qualité, cuisinière à gaz, comptoirs en granit, des planchers de bois franc et des finitions personnalisées partout. Cette unité de coin calme et sécurisée avec plafonds de 9 'dispose du sol au plafond baies vitrées, pour profiter des vues à couper le souffle. Les chambres sont équipées de nouveaux lits queen size avec des draps de qualité et une décoration. Notre condo est un «adultes seulement» get-a-way. Désolé-Pas d'enfants admis. Nous offrons également un environnement sans fumée et sans animaux pour votre confort. L'unité comprend un parking souterrain sécurisé pour 1 véhicule. Avec une promenade Score de 98, vous êtes à quelques pas de tout ce que Victoria a à offrir; shopping, la culture, le tourisme, les maisons de café ou les délices culinaires fabuleuses de la scène alimentaire remarquable à Victoria! Grande salle de bain quatre pièces avec une douche fabuleuse et baignoire profonde. L'enregistrement s'effectue à 4h00 une certaine flexibilité peut être disponible s'il vous plaît renseigner avant de confirmer votre réservation. How do you describe the perfect little condo? amazing restaurants, Chinatown and downtown Victoria. Be sure to visit Munro bookstore when you are there. We will stay here again next time we are in Victoria. Here is an amazing home away from home. 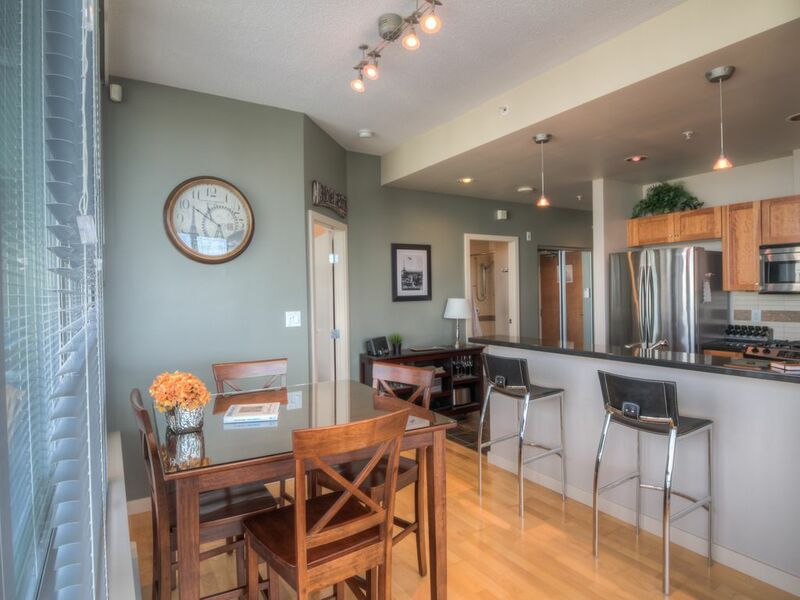 This beautiful downtown location has everything one needs for their vacation stay. It is very clean and well equipped. The downtown location is in close proximity to the waterfront, restaurants and shopping. There is secure, clean, well lit parking with easy and secure access to elevators. i would highly recommend this unit for your next stay in Victoria. Having guests that appreciate all extra details of our unit is the best compliment! We look forward to having you back again in Victoria. We love visiting Canada.This has been our best trip due to our stay at ''Hotel de Paris''.Shawn has decorated the apartment with warm attention to detail and comfort.Location is great for walking lower Victoria and enjoying its history.Wonderful restaurants for all tastes are safely nearby by foot.Highly recommend Hop On Hop Off Grey Line bus tour. Since the location is in the city you can expect common sounds like sirens at night.Good to know there is security. We would stay here again without doubt. We could not have asked for better lodging. The apartment was very neatly decorated, modern but with warmth and comfort. It had many lovely details but did not seem cluttered. The beds were very comfortable. The kitchen was well stocked. There was a convection oven, gas stove, microwave, toaster and coffee maker. There was a grocery store within a few blocks as well as restaurants and liquor stores. We had all of our breakfasts at the apartment and made dinner several nights. The bathroom had all new modern fixtures. With the washer and dryer we were able to keep up with our laundry. The location was very convenient. We were a 15 minute walk to the inner harbor and right next to Chinatown and there was a bus stop on the corner. We were far enough away from the inner harbor to avoid the crowds from the cruise ships. The views are spectacular and Shawn even provided binoculars to better see out over the harbor. The living room and second bedroom have a western view with nearly floor to ceiling windows. Across the street is the original city hall building. Nearly the entire northern side of the apartment is windows as well. We were there in late September and the temperatures were moderate with highs around 60. There is no air conditioning but there are two stand fans and ceiling fans in each bedroom. We did not need to open the windows to stay comfortable. Be advised that if it is warm enough to need to open the windows you will hear the normal city sounds of construction, traffic and sirens. This would be true of any apartment in the downtown area. Shawn is a wonderful host and provided information about all of the local restaurants, happy hours, stores and shopping. The apartment included cable television and wifi. We would certainly stay here again if we are ever in Victoria. Everything in the condo was perfect. Shawn is an excellent host. Wonderful views of the city. Almost everything in walking distance. Our condo is set up for ADULTS ONLY* Rental requests for children will not be accepted; minimum age of 25 for renters. And No Smoking, No e-cigarettes/VAPES or Medicinal Marijuana; this is strictly enforced in the unit and on the balcony. NO PET property. Our check in time is 4:00 PM; slight variations may be available at time of booking. Thank-you.